In recent literature, there have been consistent debates on how rural non-mechanized farmers can reorganize themselves in order to ensure inclusion and benefits from value chains. However, these debates do not take into account the social processes existing within the value chains, which are embedded in the cultural practices of the people. 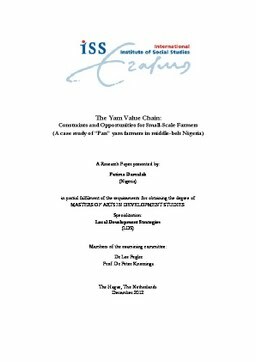 This paper therefore tends to critically examine both the social and economic processes that have contributed to the incorporation of farmers into the yam value chain and as a result, made them more effective and efficient in the process. The location for this study is in Central Nigeria with particular focus on the capitalist-oriented Pan farmers and their socio-economic production processes such as accumulation of many wives and reciprocity arrangements to improve production. These production processes are further compared to their immediate competitors the Eggon, who produce the same product within the same region but are more market oriented using wage labour. These two groups were compared based on economic and social indices to determine which of them is most efficient. Key findings showed the importance of the social labour organisation in both communities towards the production efficiency. However, it seemed also that the valcue chain governance structure at the local markets had a major role in determining the share of the revenue that was returned to the farmers. In addition, other findings, which were derived during the research, identified a number of governance issues, which go beyond labour organization. These issues were also investigated. Finally, this paper concludes with a socio-economic review with a review based on observations on the Pan farmers.